Kevin, Nick and Joe Jonas are finally getting the gang back together again. The brothers made the announcement on Thursday afternoon by revealing that they will be taking over the "Late Late Show With James Corden" in honor of their return to the music scene. And now they are ramping up the excitement even more by releasing their new single "Sucker." The new bop is an upbeat song about being head over heels in love with someone, with lyrics like, "It's true I'm a sucker for you." And to make this music video even sweeter, each of the brothers' significant others make cameo appearances! 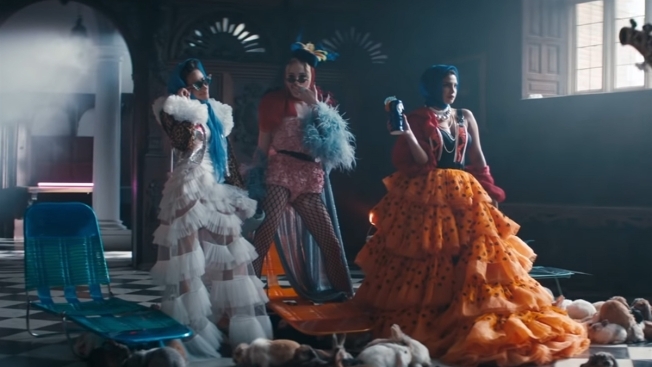 Priyanka Chopra, Danielle Jonas and Sophie Turner all pop up in "Sucker." Fans began to suspect that Nick, Joe and Kevin had a project brewing when the band's Instagram and Twitter pages were randomly reactivated in 2018. However, Nick made sure to shut down the rumors of a reunion when he stopped for a chat with E! News' Ryan Seacrest at the 2018 Grammys. "We hung out for a weekend all together then I guess our Instagram is restarted or reopened. But I can tell you there's no reunion planned, but I can never say never. You never know what's going to happen," Nick said of the speculation. Now that the band is officially back together again, they are going all in on the reunion. Fans have plenty of appearances to look forward to with the guys taking part in James Corden's hilarious "Spill Your Guts or Fill Your Guts" and a brand new episode of Carpool Karaoke.